A mandated six-month warning would allow the FDA to engage in some sort of mitigation efforts, but there are potential risks, too. Half a year seems to be a very long lead-time. FDA action could send a signal that would prompt hospitals and other providers to hoard. Likewise, if a drug maker is nervous about being punished for not giving a six-month warning, he could “cry wolf” and simply notify the FDA every six months that he is going to shut down. On the other hand, a drug maker might choose to withhold discontinuance information and suffer FDA fines rather than expose his market share to competitors. It is far from clear that this increase in regulatory power would improve the quality of information about forthcoming shortages. Nor is it credible that the FDA will substantively improve its approval of new generic suppliers. The current shortage of sterile injectable drugs, after all, took place on the FDA’s watch. It hardly follows that legislation giving the FDA more power over drug makers will alleviate the current shortage of crucial medicines. One purpose of early notification would be to prompt the FDA into accelerating its approval process. But the FDA has good reason to do that already, knowing that the shortage of sterile injectable drugs is harmful to patients. These observations lead to several recommendations, mostly targeted on the supply side. Limit the FDA’s power to compel advance warnings. Legislators should be very skeptical about increasing the FDA’s power to compel manufacturers to give a six-month advance warning of forthcoming shortages. This mandate is likely to confuse the issue more than clarify it. Be cautious in the adoption of user fees for FDA approval. The generic drug industry should not assume that increasing the FDA’s revenue will improve its performance continuously. Twenty years of experience with user fees for regulatory review of innovative patented drugs shows that such improvement is maintained only by constantly increasing funding to the FDA. Allow informed use of non-FDA-approved sources from developed countries. As the author has recommended in another recent study, if people in other developed countries can use drugs not approved by the FDA, American doctors and patients should be free to use drugs from those manufacturing facilities as long as it is disclosed that they are not FDA-approved. Consider the example of the Sandoz plant in Canada, which is in compliance with Health Canada’s regulations. End the FDA’s monopoly over drug certification. Congress should define a long-term goal of moving the FDA away from a regulatory monopoly to a “certifier of certifiers,” allowing qualified companies to investigate and approve drugs and drug manufacturers for legal entry into the health care market. This would increase regulatory capacity with private-sector third parties that would have far better incentives to deliver cost-effective quality assurance than the FDA does. Such private certifiers already exist, from Underwriters’ Laboratories, which certifies tens of thousands of products in areas such as fire safety, to the Snell Memorial Foundation, which certifies helmets for bicycling and other sports. This arrangement would speed market entry by drug suppliers, including entrepreneurial generic manufacturers that would invest in market research to inform them when to ramp up production in anticipation of a forthcoming shortage. This would result in much better systemic redundancy than increasing the regulation of incumbent suppliers, as recommended by the Obama administration and (unsurprisingly) the incumbent suppliers themselves. Furthermore, because the third-party certifiers would focus solely on quality of output, not processes, drug makers would be more likely to differentiate themselves by innovating new manufacturing technologies. 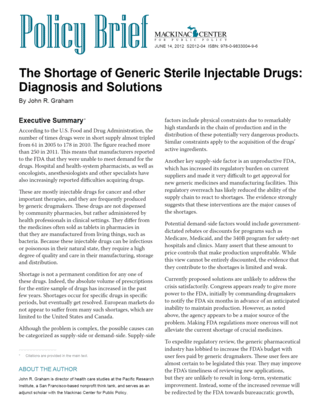 Move sterile injectable drugs to Medicare Part D. Although this analysis concludes that demand-side causes of the shortages are likely not critical, they cannot be entirely discounted. Medicare, especially, experienced a major change in reimbursement around the same time that shortages started to increase. Fortunately, the Medicare Part D program shows a way to eliminate the risk that the government-dictated pricing mechanism in Medicare Part B will harm access to injectable drugs. By moving injectable drugs from Part B to Part D, where drug makers negotiate prices with private insurers, the federal government will save money and ensure that prices for these drugs more closely reflect their value. Because physicians should be paid based on their services, rather than how many drugs they administer, it is likely that moving certain injectable drugs, especially cancer medicines, to Part D would result in innovative payment models. Indeed, at least one private insurer has announced an effort to pay cancer specialists for outcomes, rather than injecting drugs. It should be relatively straightforward for insurers to employ such innovative payment mechanisms once certain injectable drugs are moved to Medicare Part D.
Reducing shortages of generic injectable medicines is a worthy goal. To achieve this goal, U.S. policy should reduce the FDA’s power, expand patients’ freedom to use generic injectable drugs from additional sources and encourage entrepreneurs to enter the market faster with innovative production techniques. [*] John R. Graham, “Leviathan’s Drug Problem: Increasing Patients’ Choices Through International Competition in Pharmaceutical Regulation,” (Pacific Research Institute, 2010), 35-36, http://goo.gl/6yyMl (accessed May 21, 2012). The FDA’s most recent report concludes that the median time to standard approval in FY 2010 was 10.1 months: “FY 2011 Performance Report to the President and Congress for the Prescription Drug User Fee Act,” (Silver Spring, MD: Food and Drug Administration, 2012), 4.